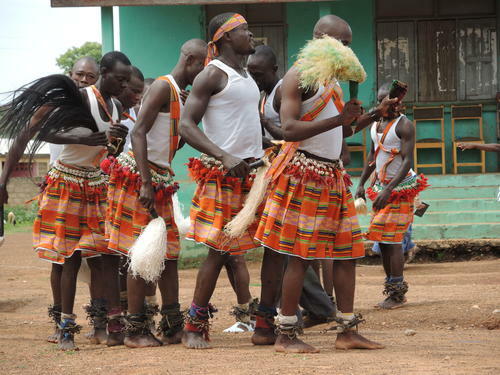 Sisaala Tumulung is one of the 58 languages of Ghana spoken by some 100,000 people in the grasslands of the Tumu district in the north, not far from the Burkina Faso border. In this tropical climate region there are only two seasons: the rainy season from March to September, and the dry season from October through February, during which the Harmattan blows from the Sahara desert, turning the sky to a dusty haze. 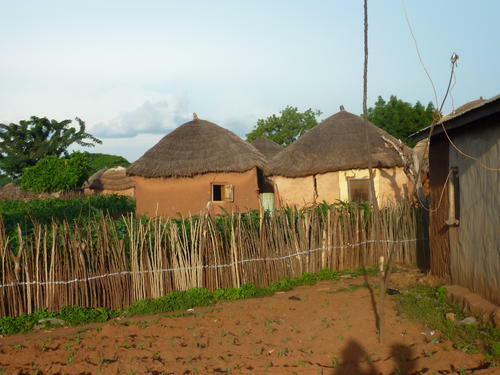 Most of the Sisaala are in small villages where they live on harvests of corn, peanuts, cotton root yams, and manioc. Even though in Ghana school is theoretically free and obligatory, most children quit school between 8 and 12 years old when the expenses of schooling increase and are no longer affordable for the family. As a result, a large majority does not speak and read English very well, even though it is the official language. Over the past two generations a large majority of the Sisaalas have turned from ancestral animism towards Islam. Nevertheless, their deep beliefs remain in ancestor worship and the fear of spirits that must be appeased by rituals defined by their tribes. Up until 1969 there were no portions of the Bible existing in Sisaala Tumulung, and despite the efforts of several missionaries, very few Sisaalas had been converted. 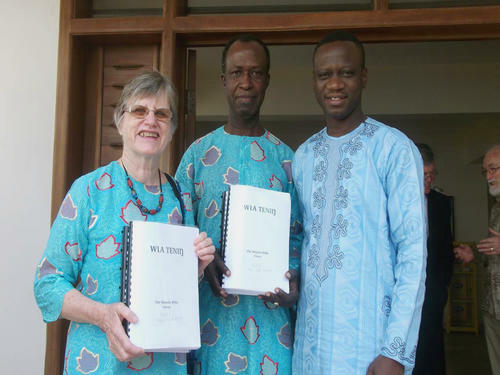 At that time, two Wycliffe missionaries from Switzerland – one being Margrit Haudenschild, who will marry Justin Frempong a few years later – began analyzing the language and putting it into writing. Since then, after starting literacy classes and translation of the Gospel of Mark, several have followed Christ and been baptized. At the time of these first translations, intense literacy efforts brought the level, in some areas, to 25% of the people able to read! Among these first literates, two were accepted in a Bible school and one eventually became a translator of the Old Testament. In 1984 the arrival of the New Testament was celebrated. At the time they did not plan to continue with the Old Testament but in 2001, due to the persistence of the Sisaala Christians, a team of four local translators began the work with the faithful support of Margrit and Justin. We had to wait until 2014 to finally complete the task after 45 years! Dokta and Batong are two Sisaala brothers who were raised in a Catholic family in a village that was very Muslim. Dokta, the elder brother, chose to adopt the religion of his friends so as to not be rejected. Batong was still young when he seized the opportunity to learn to read Sisaala Tumulung through a literacy program. He became passionate about reading the New Testament that a teacher gave him. Dokta had to quit school when young, and as a young adult he did not know how to read and write. He was intrigued to hear his brother reading out loud from this strange book. By curiosity he asked him to read a few pages, and he in turn became fascinated by the extraordinary stories of Jesus. He was so interested, that he asked his brother to teach him how to read. He made rapid progress, and soon could read well. His friends, surprised to see him reading, when he could not read a few weeks earlier, made fun of him. He answered them that he, at least, understood what he read, whereas they who heard and repeated the phrases of the Qur’an in Arabic, didn’t even understand what they said! Some time later Dokta confided to his brother that he wanted to become a disciple of Jesus. The two brothers then asked to have a missionary come from Tumu, a Ghanaian named Seth, who explained to them the Gospel, and invited them to confess their sins and offer their lives to Christ. Today the two brothers still love to get together to read the New Testament and pray together. They witness their faith without fear in the surrounding villages and encourage the brothers and sisters in the churches. Last June 28th I had the privilege of sharing with the Sisaala people this unique moment of their history. It goes without saying that joy, gratefulness, and pride were palpable during the ceremony. 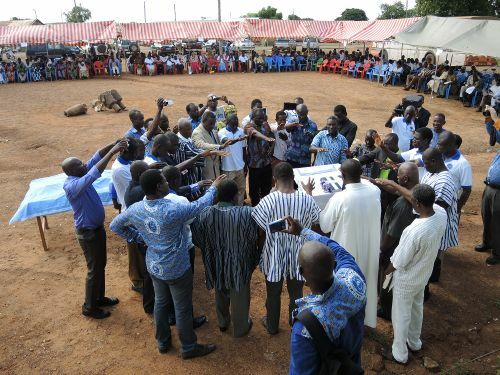 As in many African cultures, celebrations are a mix of a large dose of protocol (nearly a dozen speeches! ), a little folklore, and especially an immense hope of seeing God transform lives by his Word and thereby bring revival to their society. 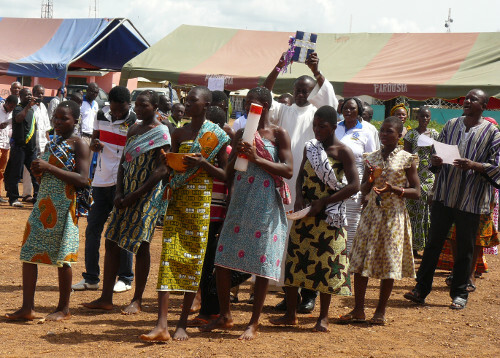 The celebration took place in Tumu, the district seat. By the grace of God, the sun came to the meeting, and even though it was humid, the heat was reduced by a storm the evening before. Four hundred chairs were set up around the town square under canopies. The ceremony was scheduled for 10 am, but it wasn’t until 11:30, after having found some more chairs, that everyone was ready and the program could begin. The speeches, some in English translated into Sisaala, others in Sisaala translated into English, followed for nearly three hours, separated by church choirs and tribal dances. 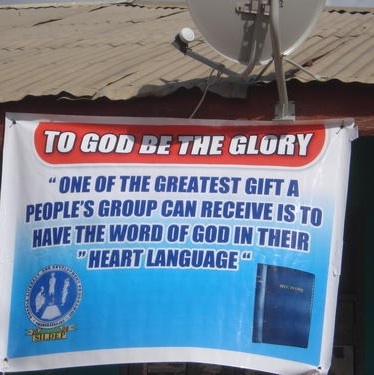 Among those messages that I was able to understand through the accent and the poor sound quality, several were exhortations to Sisaala Christians to nourish themselves on the Word of God that is now entirely available in the language they love and know the best. We had to wait until the end of the speeches for the Bible to be finally literally unveiled. The priest of the town received a decorated copy, raised it in the air, and walked around the square, followed by a group of children singing and throwing flower petals. Then all the pastors present were invited to gather around the Bible to invoke the name of the Lord. In their prayers they asked Him to cause to grow the seed that will be sown by means of the written Word. Even though the Bible now exists in written form, there still are enormous challenges of literacy and learning to use the Bible. Fortunately the Sisaalas are off to a good start. They have already an audio version of the New Testament, the Jesus film, and a dynamic literacy program that is self-supporting, which is rare, and durable. The Sisaalas are now proud of their language and hope one day that it will have the status of being taught at the University. Currently only 11 “major” languages are recognized by the government. As an example, two young children were invited to the stage to read the first chapter of the book of Joshua. Even though I understood nothing (not even the name of Joshua! ), I heard their fluid reading and saw in the faces of the audience that they understood perfectly what was being read. Before ending the celebration, the Bibles were sold at an affordable price equivalent to about two day’s wages for a farmer. We saw children, youth, and also “elders” leaving proudly with their first Bible in Sisaala Tumulung!